Ridgefield Park, NJ – January 4, 2012 – Samsung Electronics America Inc., a subsidiary of Samsung Electronics Corporation, today introduced the next evolution of its award-winning Central Station, the Series 7 Samsung Smart Station, as well as a redesigned Series 7 HDTV monitor for a whole-home solution. Part HD monitor, part wireless docking station, the second generation Series 7 Smart Station (CB750) builds upon the successes of its predecessor and now integrates with mobile devices in addition to notebook PCs, peripherals, network and AV, providing users with a simple and convenient way to increase productivity. The new Series 7 HDTV monitor (TB750) includes HDTV functionality with a built-in TV tuner and integrated wireless display (WiDi) technology from Intel® for added connectivity to the TB750 as well as integrations with mobile devices like smartphones and tablets for added versatility. 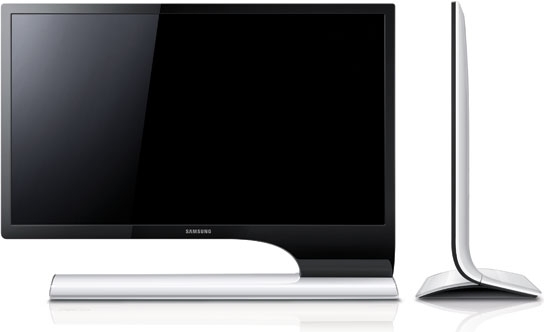 The Series 7 Smart Station, available in 24- and 27-inch configurations, and the Series 7 HDTV monitor, available in 24- and 27-inch configurations, will be available on display during the 2012 International Consumer Electronics Show in Las Vegas at Central Hall booth #12004, January 10-13.